By the 1530s when its gold mines were exhausted, Puerto Rico was insignificant to the Spanish Crown as a source of wealth and trade when compared to the larger colonies of Santo Domingo and Cuba which had already turned into predominantly agricultural economies. For most of its history, sugar was the main agricultural product on the island with coffee, tobacco, ginger, indigo and cotton being minor crops. In Fray Iñigo Abad y Lassierra 1788 book Geographical, Civil and Natural History of the island of San Juan Bautista de Puerto Rico he stated that "Agriculture is the first of the arts and the real wealth of a state, it is at its very beginnings in the island. For the most part it is limited to the cultivation of legumes and fruits for personal consumption, without offering to commerce any amount worthy of attention." He continued saying "They dedicate great care to coffee, which bears fruit slowly, requires little care and has assured markets abroad where it is craved because of its quality and the harvest in a normal year like 1775 is 45,049 bushels." The coffee plant is said to be native to the African Ethiopian region of Kaffa , it was in Europe that it first became a popular drink. The most accepted theory regarding the arrival of the coffee plant in Puerto Rico is that it was brought by the Spaniards in 1736. According to Historian Fernando Picó, in the 1780s coffee became the principal agricultural export surpassing tobacco. By 1812 activities related to the export of sugar and coffee were the principal activities dominating the island's economy. According to Archeologist Luis Pumarada, sugar for export dissapeared in the 1700s when the local industry turned to the production of molasses. Around 1770, coffee became the main agricultural export product until ca. 1830 when sugar again took over as the main export product for a short 20 years when coffee again became the main export product until ca. 1902. The first census available in Puerto Rico is the one for 1765 included in Alejandro O'Reilly memoirs which stated the island's population at 44,883. As a result of the Spanish Crown's Royal Decree of 1778 that allowed trade with other colonies and most ports in Spain and the Royal Decree of 1779 that allowed slave trade, the population of the sparsely populated island grew almost fivefold from 44,883 to 220,892 in the 50 years between 1765 and 1815 according to the population numbers reported by Fray Iñigo Abad. The Royal Decree of Graces of 1815 that granted naturalization to foreigners that worked the land given them and pledged allegiance to the Catholic Church and to the Spanish Crown, created a further increase in population and in agricultural activity in Puerto Rico. In just 17 years after the Royal Decree of Graces, the island's population grew at an annual rate of 4.4% from 220,892 in 1815 to 350,051 in 1832. The first census after the 1898 US occupation taken as of 11/10/1899 reported a population of 953,243 or a 613% increase from the 1800 reported population of 155,426. Due to the Haitian Revolution , the coffee industry in Puerto Rico was greatly improved with the immigration of French citizens from Haiti which at the time was the major exporter of coffee to world markets. After 1815 there was an influx of people from the Meditarranean island of Corsica who settled around the municipalities of Yauco and Maricao and dedicated themselves to cultivating coffee. Coffee production in Puerto Rico is widely associated with Corsicans and Yauco. Corsicans contribution to the development of the coffee industry in Puerto Rico was undoubtedly very important, but the unheralded contribution of Catalonians and Majorcans who owned the majority of haciendas in Maricao and Lares had as much if not more influence. 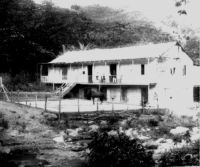 According to Archeologist Luis Pumarada, in 1829 Mayaguez was the major port for export of coffee in Puerto Rico since the majority of the French immigrants settled in the Western part of the island. Even though by the 1830s, sugar exports began to surpass those of coffee, in the 1850s due to an increase in world coffee prices and a crisis in the sugar industry, coffee production began to surpass sugar and it was during this time that coffee exports to Europe started to grow and Puerto Rican coffee obtained one of the highest quotations in the world markets. By 1877 there were 843 registered coffee haciendas throughout approximately 69 municipalities, 234 of them in Maricao . During the second half of the 19th Century, Puerto Rico enjoyed a second-to-none prestige in the coffee world. By the 1890s Puerto Rico was the sixth largest exporter of high grade coffee worldwide and the fourth largest in the Americas. Coffee production peaked in 1898 when exports were approximately 600,000 quintals . Unfortunately, after the Spanish-American War of 1898 , the island's coffee industry started to fade due to Hurricane San Ciriaco of 1899 that destroyed the coffe crop, to the fact that the newly arrived US investors were more interested in the sugar industry and to the fact that Spain, until then its major market, could no longer import Puerto Rican coffee tariff free as a colonial product. The Louisiana Planter and Sugar Manufacturer in its February 8, 1908 edition states: "The natives cannot understand why the United States does not place a heavier tax on the coffee that comes from Brazil and other South American countries, thereby giving the Porto Rican product protection. They do not realize that the whole output of coffee in Porto Rico would hardly more than supply New York City. Under Spanish rule Porto Rico sold nearly all of its coffee to Spain, but when the island became part of the United States, the Spanish Government, of course, placed a tariff on Porto Rican products, as did Cuba. The result was the market for Porto Rican coffee was largely taken away. Recently the reduction of the maximum of the French tariff on Porto Rican coffee has opened up a market for that product, and the coffee planters are happy." In their 1988 study Industria Cafetalera en Puerto Rico 1736-1969, by Luis Pumarada O'Neill and Rafael Pumarada, they list the coffee plantations that in their opinion were the best kept at the time and still had all the principal elements of the different production phases of 19th Century coffee haciendas in Puerto Rico. They denote with an * the most complete and better kept ones. We want to thank Dr. Lillian M. Lara Fonseca at the State Historic Preservation Office who allowed us to review most valuable documents and reproduce pictures used to document information herein provided. We also want to thank Archeologist Dr. Luis Pumarada O'Neill and Lisette Fas Quiñones of Cafi Cultura Puertorriqueña, Inc. (Cafiesencia) for contributing to this project by sharing their work and extensive knowledge in the history of the Puerto Rican Coffee industry. The gallery below includes old pictures of haciendas that existed during the 19th Century and early 20th Century for which to the best of our knowledge there are no remains today.